Today is Good Friday. It was the most hopeless day in history. But…it was the day when hope was given to the whole world. My thoughts this week are on how Jesus did everything He did, “for the joy that was set before Him.” This was my motivation for this event. All the suffering and challenges…it’s all for joy. Let me clarify. I have sacrificed a lot to strengthen pro-life ministries and networks. But I’m not a martyr. I haven’t been persecuted for pro-life work. But, I do think the recent March for Life events were a kind of “spectacle”, a little like Jesus’ death on the cross. For those who don’t believe in the inherent dignity of the unborn human being, then it is foolishness to speak up for their rights. It all seems strange and useless. What’s the point? 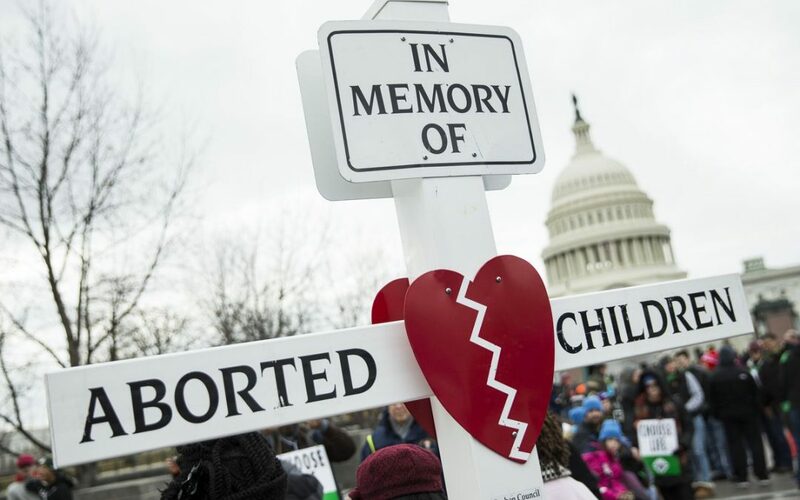 The March for Life events were a sacrifice. This was an offering of love, for children who have not yet been born. On a human level, we know that the most robust hope for the future of humanity comes through nurturing the next generation–not through killing them. The March for Life also publicly exalted Jesus, pointing people to the beauty of His Incarnation. And it’s all for joy. Just like Jesus’ death on the cross, all our sacrifices are for the sake of joy. Photo 1. Pastor Kenzo (Pro-Life Japan) sharing about the ministries he started in Japan. But in the eyes of the world, a pro-life ministry–that protects the weakest human beings–it is ultimately foolishness! The world continues to kill 25,000,000 unborn children in East Asia each year, and considers this necessary, and even wise. 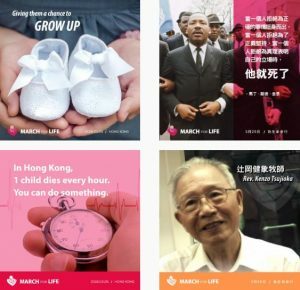 In the midst of the violence and darkness of so many hearts and minds, the pro-life ministries represented at the March for Life are bringing hope and saving lives in Hong Kong, all around China, and throughout East Asia. We watch and pray, and stand and wait. It is still dark, but we wait in expectation for the promises of God. When we walked between the events at 2 different churches, small groups stopped and prayed for several minutes in front of the FPAHK, where there are more than 3,000 abortions every year in Wanchai. Photo 1: This photo includes several of Hong Kong’s pro-life leaders. Photo 2: The 3 men in the prayer circle are Kevin Lai (founder of Joy of Life), Dominic Chan (Vicar General of the Catholic Diocese), and Dicky Cheung (張衛健, a famous Hong Kong actor). Photo3. The sign says “Don’t Abort On Children’s Day” （兒童節不要墮胎）. 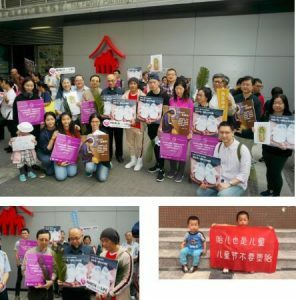 This photo was from a public pro-life outreach on June 1 (Children’s Day) in Mainland China. The founder shared about how their annual event has already saved many lives, inspired new pro-life ministries, and is also moving hearts inside and outside the Church towards life. (It was also the catalyst for me to begin pro-life work in Hong Kong.) We also heard from Pastor Kenzo and FX, who started pro-life pregnancy resource ministry in Mainland China and Japan. The 2018 March for Life invited people to exalt Jesus, to honor the mystery of His Incarnation (celebrated on March 25–nine months before Christmas), and to pray and work for an end to abortion. Over 150 people attended. It began with an event at OLMC Church–Wanchai’s first Catholic church–and finished with an event at CCC Church–Wanchai’s first Protestant church.